Some leading photographers are using their talent to try to help foster kids find homes. As Early Show correspondent Benno Schmidt reports, the photographers are focusing on the kids in a project dubbed "Heart Gallery," shooting portraits that are widely displayed. Schmidt says many of the kids Heart Gallery tries to help are older -- and the older they are, the less likely it is they'll be adopted. Jazzie, 15, is one of the Heart Gallery kids. She attends church, Schmidt says, looking not just for the comfort of song and prayer, but for something more, something many take for granted -- a family. "I just want somebody to love me and nurture me," she tells Schmidt. "It makes me feel like what's wrong with me; what did I do to not deserve a family?" Schmidt assured her the answer is -- nothing. It's not her fault. "Teens need people, too," she says. "Just give me a chance and let me know that I deserve a home, that I deserve to be with you." Schmidt says many of the Heart Gallery volunteer photograhpers are big-time photojournalists who often shoot celebrities but, for the project, aim their cameras at the forgotten kids. The photos are then put in galleries at museums, airports and libraries in any one of the 45 states taking part. A professionally shot portrait of Master, 14, "started it all" for him, he says, appearing in Heart Gallery in 2005, and leading to the aspiring chess champ being adopted by a family who saw the portrait and was moved to take him in. His new father was himself a foster child, and understood the struggles and pain of being in foster care. Najlah Feanny Hicks, president and co-founder of The Heart Gallery of New Jersey, says, "You've gotta have respect for children who say, 'No matter what my parents did to me, no matter who deserted me ... I still believe that somebody wants me,' and I believe that these children are wanted." So, photographers such as Martin Schoeller and Stewart Shining, normally busy with celebrities, have some new subjects. "Some of them have asked me if I can take them home," Schoeller says. "They're just asking for the most basic thing - to be loved by someone who cares about them." Looking at photos of Heart Gallery kids, Shining remarked, "What's not to love?" 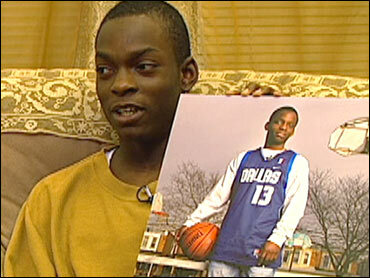 Henry, 16 and looking to be adopted, told Schmidt, "No matter how old you get, everybody needs love." Those who already have adopted, say taking the step is well worth it. Says Tracy, Master's new mom, "Kids are not looking for anything. They're just looking for love. It's all about love." To contact the Heart Gallery of New Jersey, click here. To get in touch with the Heart Gallery project, call 1-800-99-ADOPT. The current Heart Gallery exhibit is at Liberty Science Center in Jersey City, N.J.